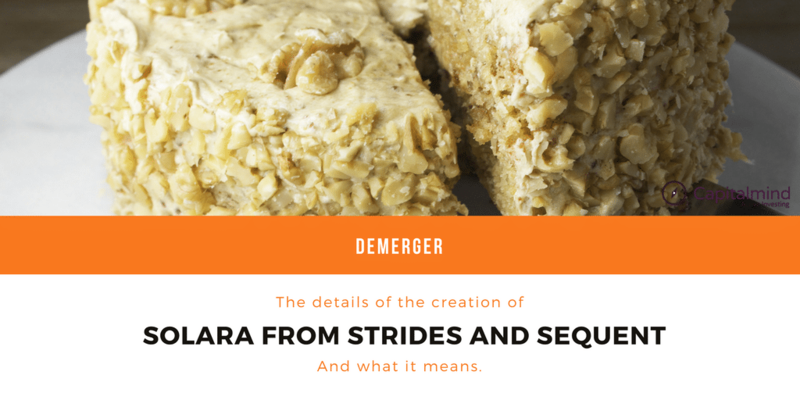 Strides and Sequent Scientific Demerger into Solara : What is in it? When we buy a tablet (drug) , the money we are paying is for the active pharmaceutical ingredients also called API which is the key ingredient in a drug that actually cures a disease. Yet, the API business is a high volume low margin business. Arun Kumar, the executive vice-chairman and managing director said: with the commodity API business continuing to put pressure on margins with cost of compliance going up, it was better to hive off the low margin API’s of drugs such as Ibuprofen, Gabapentin and Ranitidine while at the same time retaining API’s for complex generics and other API’s used in house. Since API’s of Strides Shasun alone wouldn’t be enough to be workable for a new company, Sequent Scientific, a company with the same set of promoters has also decided to demerge some of its API businesses. Strides Shasun and Sequent Scientific (Listed entity) are demerging to form a separate entity called Solara Active Pharma Sciences Limited (SSL). The new entity will be a “API ONLY” business. Strides Shasun will be demerging its commodity API business and Sequent its Human API business which together forms Solara. Effectively, Strides is giving a part of itself, and Sequent a part of itself, to become Solara. Every Strides shareholder will get some part of Solara. Every Sequent shareholder will also get a part of Solara. And all these businesses will co-exist. In March 2017, the board pf directors of Strides and Sequent has approved the demerger of their respective API business. After a couple of months the draft scheme for demerger was released and only in March 2018, the scheme got passed by NCLT. The ex date for demerger was on 06 april 2018. According to the scheme, for every six shares held in Strides, one share of Solara will be allocated. And for every twenty five shares of Sequent, one share of Solara will be allocated. In time, we should see SSL Pharma as the new company is being called listed on the stock exchanges. Solara will be owning Strides commodity (B2B) API business along with 2 manufacturing plants in Pondicherry and Cuddalore. Solara will also be holding shares in Strides 49% subsidiary Chemsynth and its 100% subsidiary Shasun Inc USA. And from Sequent, Solara will be getting Human API business (B2C) along with 3 manufacturing plants in Mangalore, Mahad and Mysore. Solara will be also be holding shares in Sequents 89% subsidiary Penems private limited. The all new API business will be having five manufacturing plants with three of them USFDA approved. What Will Strides Pharma Retain? Strides Pharma post demerger will own consumer formulation business with presence in India, Africa, US, UK and Australia. The front end presence will be backed by four USFDA approved plants in India, Europe and Singapore along with three R&D centres. Sequent will be a pure play Animal Healthcare API business going forward. Sequent will own four formulation facilities and one USFDA API manufacturing facility in India. Apart from that it will be having front end presence in Turkey, Spain, Brazil, Belgium, Netherlands, Luxembourg and Sweden. It’s difficult to get the exact details of the balance sheet that will be split in demerger. However the valuation report provides some glimpses of the basic composition of the new entity. According to the valuation report, Solara Pharma’s enterprise value is pegged at Rs 1,882 Cr. Out of this Rs 1,260 Crs will be coming from the commodity API business (demerged from Strides) and Rs 622 Crs will be coming from Human API business (demerged from Sequent). The total debt in the new entity SSL will be at Rs 504 Crs. If the same is discounted from the enterprise value, then the equity value of Solara stands at Rs 1372 Crs. The total EBITDA of Solara for FY17 would be at Rs 176 Crs, going by the current company. How Much Are Strides And Sequent ? For Sequent, the proportion is still higher. Sequent will be losing out 54 Crs of EBITDA, which is 54.74% of its consolidated EBITDA. And on the debt part Sequent will be losing out Rs 72 Crs of debt, which forms 20% of Sequents outstanding debt as on Fy17. Effectively, a shareholder loses around half of his valuation to Solara, so he’ll get one share for every 25 he owns in Sequent. Along with the demerger, Strides is also selling its 51% investment in Medispan to its promoters. Medispan was unable to show in progress in its business post its acquisition from Shriram Group in 2015. Apart from that, Strides will be consolidating its Kenya unit under branded generic products and will be selling off its remaining six generic facilities in Africa. The intended objective of the restructuring is to form superior margin profile business by focusing on supply chain and front end formulations. How Much Will Solara List At? We can’t be sure. But there’s a potential way to predict. Assuming we give an 10x EV/EBIDTA valuation, and the EBIDTA is 176 cr, then we have a potential enterprise value of 1760 cr. Take out the debt of 422 cr. and we have about Rs. 1300 cr. of equity value. Solara will have 2.5 cr. shares (1.5 cr. shares to Strides shareholders, and 1 cr. shares to Sequent shareholders). So the per-share price of Solara should be around Rs. 500-600. Solara, after an EBIDTA of Rs. 176 cr. is likely to earn a PAT of around Rs. 90 cr. A 1300 cr. market cap will be a 15 P/E ratio, which isn’t too high. And that will still bring in a price around Rs. 500 or 600. This is just an educated guess, of course. We’ll have to see the listing and any intermediate results, in order to really know the price. There is no timeframe available on when Solara will be listed. We assume it will happen before September 2018. The de-merger was completed earlier this month and Solara is yet to get listed on the Exchanges. Every shareholder who held 6 shares of Strides Shasun on the Record date received 1 share of Solara. But if you had bought the Strides shares before the demerger, how do you split your purchase price between the Stride and Solara shares you will be credited? We’ve written a detailed and FREE article on the subject: How to calculate your purchase price in case of a demerger? 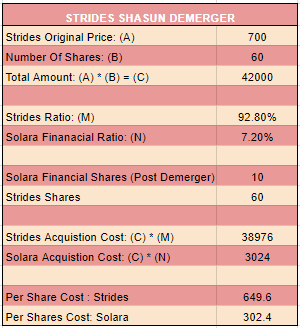 Strides has released the calculation for cost of acquisition of Solara for shareholders who held the stock on the record date. Assuming you bought 60 shares of Strides at Rs 700 each before the demerger. Below table gives you the calculation of your buy price of both Strides and Solara post demerger. Note: While the demerger also involves Sequent Scientific, the cost of acquisition has not been released by Sequent. We will update the post as and when the disclosure is released. Disclosure: We do own Strides Shasun in our Long Term Portfolio. Please do not consider this as recommendation, this is purely for informative purpose. We expect that in the next tax season a lot of people will want to know, so they can calculate the tax impact.